Increasingly I have been called to quote on jobs that have been started by an enthusiastic customer. Usually they have been advised to use a major branded water based enamel paint and then have become dismayed by the poor quality of finish and the amount or coats that are required to hide the colour underneath. So was this the best paint for the job and invariably I will say no. I have found that over the years I have been better off using conventional oil based enamel paints as they hide the colour underneath and flow far easier to provide a smoother finish this is especially important on flat panel doors. When could a water based enamel be used. Initially we need to know the surface that is to be painted and there are two questions you should be asking. Has it been painted previously if yes then with what type of paint? Is it new and does it need priming? So here are some answers and tips to help you find out. There is a simple test to find out if a paint is oil or water based which is done with a clean cloth of a different colour to the paint that you are testing and some methylated spirits. Make sure the test are is clean to start with then with the cloth dampened with meths start to rub the surface or the paint. If the paint is water or acrylic based the methylated spirits will start to soften the surface of the paint and the colour will start to appear on the cloth you should not be getting any colour off an oil based paint. Does a surface need priming, read the instructions on the can in the first instance as some products are self priming then here a few further tips. 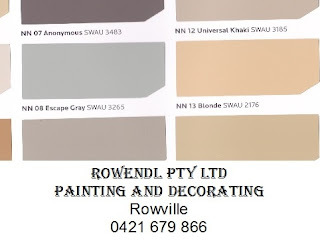 Depending on the colour that you have chosen to paint with and especially if it's a light colour, many new products are primed in some hard to hide colours and would be better off being primed but remember if your intention is to keep the surface as smooth as possible you need a smooth primer which is usually oil based. So you are sure that the previously painted surface is oil based and you desperately want to paint with a water based paint then you have to remember that water does not float on oil its the other way around which means you will need a primer which means more time and more product. In my experience using a water based enamel over an oil based paint means at least three coats of paint where the job could have been done with two and a better surface is achieved. Personally I think that water based enamel paints are OK to use on new timber or MDF architraves, skirting and timber grain embossed doors. If I have the choice it would be oil every time as I would be pretty confident that it will hide the colour underneath in two coats and that feature items such as flat panel doors would be the best they can be.